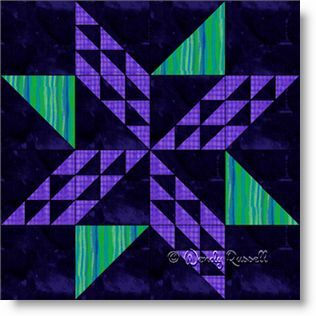 The Sparkle Star quilt block would fall into the intermediate category of difficulty. It looks very complicated, but as you will likely make this block in a larger size, the pieces are not too small to make this a difficult block to sew. There are lots of pieces, but with careful attention to your quarter inch seam allowances, this block goes together easily. This quilt block is a good choice for using up your scraps. I have shown different versions of the block so that you can get an idea of how versatile it can be. The two sample quilts illustrated show that you don't need to add much to the block to make your quilt. You can focus on extra plain blocks to feature your quilting skills or jazz it up a little by experimenting with borders. The sky is the limit!